Leman Solicitors is one of Ireland’s fastest growing commercial law firms. With a reputation built on peerless efficiency and innovation, Leman is the first paperless law firm in Ireland and also the first to discard hourly rates for their professional services, including litigation. With numerous awards including the Q Mark, the International Client Choice Award and the Corporate INTL Award, now Leman can add ISO 9001 accreditation as further recognition of their increasingly admired reputation within Ireland’s legal community. For such a decorated law firm it’s no surprise to learn that a culture of ‘constant improvement’ has always existed within Leman’s. It’s exemplified by their awards to date, and the drive to achieve ISO 9001 accreditation was driven by that innate desire to constantly improve. Despite already having efficient and effective internal processes in place Leman had no previous experience of officially recognised quality management systems – and adapting existing processes to fit ISO 9001 certification was initially quite challenging. 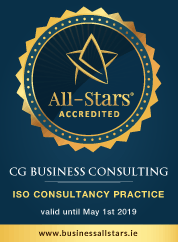 After partnering with CGBC it appears that having achieved ISO 9001 certification Leman’s culture of ‘constant improvement’ has been further enhanced, and so too the firm’s already glowing reputation.